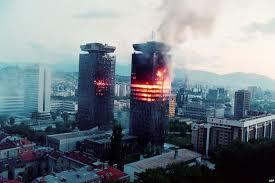 A multitude of bad and good events are tied for 6th April in Sarajevo, the capital city of Bosnia and Herzegovina. Thus, this day celebrates the anniversary of the liberation of Sarajevo in World War II, and it is very significant that four years before this event, within the German attack on the Kingdom of Yugoslavia, exactly on that day 1941, Sarajevo was swamped with bombs. Something similar happened in recent history of Bosnia and Herzegovina. Former Yugoslav army started the liberation of Sarajevo on 28th March 1945. Actions were attended by the 2nd, 3rd and 5th Corps of the Yugoslav army, 11th and 13th brigade of Krajina, 18th Middle Bosnian brigade, artillery and tank unit. After fierce battles on 6th April 1945, resistance of Germans and members of so-called Independent State of Croatia (NDH) was broken, and Sarajevo was liberated. Until the end of this action on 10th April, Visoko, Kakanj and Busovaca were liberated as well. After the liberation in World War II, 47 years later, Sarajevo started another battle. Since the beginning of the aggression and siege, until the 31st July 1995 in Sarajevo, 11.541 civilians, from which 1.598 were children, were killed, died of starvation, cold or disappeared. Material damage suffered by the city during the siege and aggression, primarily through the destruction of housing stock and the destruction of the cultural treasure and commercial objects and roads, is invaluable. Monument to Murdered Children was made at which names of 524 children for whom the documentation has been collected, and determined under what circumstances they died. The aggression on Bosnia and Herzegovina was followed by a month after a referendum. Exactly on the Day of the City of Sarajevo, 27 years ago, on 6th April 1992, when former European Union confirmed Bosnia and Herzegovina as an independent state after a referendum on which citizens have declared that they want an independent Bosnia and Herzegovina from the rest of former Yugoslavia, new attack on Sarajevo occurred.